The discovery of RNA interference has opened the door for the development of a newclass of cancer therapeutics. Small inhibitory RNA oligos are being designed tospecifically suppress expression of proteins that are traditionally considerednondruggable, and microRNAs are being evaluated to exert broad control of geneexpression for inhibition of tumor growth. Since most naked molecules are notoptimized for in vivo applications, the gene silencing agents need to bepackaged into delivery vehicles in order to reach the target tissues as theirdestinations. Thus, the selection of the right delivery vehicles serves as a crucialstep in the development of cancer therapeutics. The current review summarizes thestatus of gene silencing agents in breast cancer and recent development of candidatecancer drugs in clinical trials. Nanotechnology-based delivery vectors for theformulation and packaging of gene silencing agents are also described. Breast cancer is the most frequently diagnosed malignancy in women. In 2012, anestimated 229,060 new cases of invasive breast cancer and 39,920 cancer deaths wereexpected in women in the United States . With the availability of modern diagnostic tools and increased use ofadjuvant systemic therapies, significant progress has been made on early stage breastcancer treatment, and consequently the overall survival rates in breast cancer patients.However, only marginal improvements have been achieved in patients with relapsedmetastatic cancer, making it an urgent medical need to develop new, effectivetherapeutics to treat late-stage breast cancer. Small molecule inhibitors targeting selected protein kinases and monoclonal antibodiestargeting cell-surface receptors have shown promising results in the fight againstcancer, including breast cancer, in the past decade. However, the success stories havebeen limited to only a handful of drug targets. Many of the key cancer-causing genes aretraditionally considered 'nondruggable' , and thus not enough effort has been dedicated to these genes. Moreover,tumor heterogeneity and genetic instability make it unlikely that a single target willsuffice for long-term treatment of most solid tumors. Ever since its discovery , RNA interference has been considered to be capable of rapidly andefficiently knocking down the expression of any gene in any cell type, thus opening adoor to treat cancer by targeting every cancer-causing gene. Recent progress in researchin gene silencing agents and their delivery systems has shed light on the potential ofthese therapeutic agents for cancer treatment. In this review, we will summarize the current status of development of gene silencingagents as breast cancer therapeutics and describe the enabling systems for effectivedelivery of such therapeutics. Two classes of gene silencing agents have been the focus of intense study in recentyears: small interfering RNA (siRNA) and small non-coding microRNA. The siRNAmolecule regulates expression of a specific protein via degradation of the mRNAmolecule. It usually demands a perfect match between the siRNA oligo and thecorresponding sequence in mRNA (Figure 1). On the other hand,microRNA molecules regulate gene expression via suppression of translation. OnemicroRNA molecule often modulates the expression of a group of genes. Schematic view of the mechanisms of action of small interfering RNAs(siRNAs) and microRNAs (miRNAs). siRNAs and miRNAs are packaged intonanoparticles for effective delivery. (A) Once inside the cell, theanti-sense strand of the siRNA duplex anneals to the corresponding mRNAmolecule (inside or outside of the open-reading frame), and triggers mRNAdegradation. (B) On the other hand, the microRNA targets the3'untranslated region of the mRNA, and suppresses protein synthesis. Although originally discovered as long double-stranded RNA molecules, double-strandedsiRNA constructs of 30 nucleotides or less have been the default choice to avoidinterferon response from longer molecules . Thousands of siRNA-related research articles have since been publishedthat demonstrate the essential roles of the individual genes in cell growth andviability. Key cancer genes have also been identified through screening ofsiRNA/small hairpin RNA (shRNA) libraries for cell proliferation and survival . These genes are involved in almost all the important signal transductionpathways that control tumor initiation, progression, metastasis, and tumorangiogenesis. Detailed information on the individual genes has been publishedelsewhere, and is not the scope of this article. It has been estimated that there areabout 80 mutations in an individual breast tumor, of which a dozen are drivingmutations . Adding to the complexity, every cancer patient carries a unique spectrumof gene mutations, making the pool of mutant genes unimaginably large. While thecurrent small molecule cancer drugs can only impact a very small portion ofcancer-causing genes, the availability of the specially designed siRNAs targeting thelarge number of genes makes it possible for personalized treatment of breast cancerbased on the genetic and epigenetic changes of every patient. Genes and pathways that contribute to resistance to current cancer therapy have alsobeen identified. Trastuzumab has been a key drug to treat Her2-positive breast cancerpatients, but not everyone who is positive for Her2 responds to the treatment. In alarge scale RNA interference screening with the Her2-overexpressing BT474 breastcancer cell line, Berns and colleagues  discovered that loss of PTEN expression caused resistance to trastuzumabtreatment. Since PTEN is a negative regulator of the phosphoinositide 3-kinase(PI3K)/AKT pathway, it is speculated that activation of PI3K signaling conferstherapy resistance to trastuzumab. To support this notion, it was found thatoverexpression of PI3K also caused therapy resistance . Another application of siRNA is to sensitize chemotherapy by knockingdown expression of multidrug resistant genes in breast cancer cells. Details will bedescribed in the 'Overcoming therapy resistance' section below. The microRNAs can be arbitrarily divided into two groups based on their target genesin breast cancer. Table 1 lists microRNAs that play significantroles with known target genes in breast cancer. The group I micro-RNAs regulate keygenes in cancer cell growth and survival. These include let-7, miR-17/20, miR-21,miR-103/107, the miR-200 family and miR-708, and more members will be identified. Oneof the first identified microRNAs was let-7. This molecule regulates expression ofsuch important cancer genes as KRAS and MYC . Another example is miR-21, which is overexpressed in breast cancer. Itmodulates the activity of PI3K/AKT and ERK1/2 pathways via control of PTENexpression. Consequently, treatment of MDA-MB-231 human breast cancer cells with amiR-21 antagomir reversed the oncogenic phenotype of the cell line . In contrast to those described above, miR-103/107 exert their globalcontrol of gene expression through modulating dicer expression . 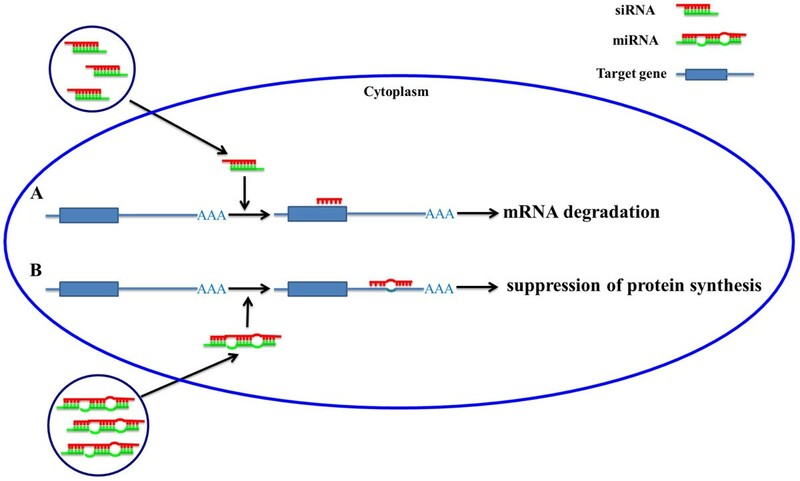 Owing to the pivotal role of Dicer in processing and maturation of allnon-coding microRNAs, fluctuation of miR-103/107 levels could have a genome-wideimpact on gene expression. Molecules such as miR-205, miR-206, and miR-221/222 represent members of the group IImicroRNA family. Besides regulating expression of many other genes, members in thisgroup also affect the expression of breast cancer surface markers such as HER3 andERα. For example, miR-205 is one of the regulators of HER3 expression . Interestingly, a recent report revealed that the expression of miR-205itself was down-regulated by Her2 . It is noteworthy that expression of one specific gene could be controlled by severalmicroRNA molecules. As indicated in Table 1, both the miR-200family and miR-205 modulate epithelial-mesenchymal transition through regulatingZEB1 expression, and ERa expression is regulated by miR206 andmiR-221/222. Most studies on the biological functions of gene silencing agents have so far beenperformed using cell-based assays. The excitement and effort in this research fieldhave not been successfully translated into Food and Drug Administration-approveddrugs for treatment of human cancers. The fundamental problem with in vivo application of gene silencing agents is the lack of effective carriers forsystemic delivery in order to overcome the multiple biological barriers . Once inside the circulation, the therapeutic agent needs to surviveattack from plasma ribonucleases. Without effective protection, most double-strandedRNA oligos will be digested within minutes. They will also need to escape eliminationby the reticulo-endothelial system (the sinusoids of the liver, the spleen, and thealveolar beds of the lung). Upon reaching the tumor vasculature, the agents will haveto fight against the unfavorable tumor interstitial pressure in order to cross theblood vessel wall. Once inside the tumor tissue, they still need to cross theextracellular matrix and bypass the connective tissues before reaching tumor cells.Since the unmodified double-stranded RNA oligos are negatively charged, they cannotpass the cytoplasmic membrane to reach the cytosol where they act. The default choiceto facilitate cell entry of siRNA or microRNA is to package them into cationicnanoparticles. Nanotechnology has played a predominant role in the design of variousforms of carriers for in vivo delivery of gene silencing agents so far. Interestingly, nanotechnology has been used in breast cancer therapy for decades.Doxil, the liposomal formulation of doxorubicin, is the first nano-drug approved forbreast cancer therapy; doxorubicin is a potent anticancer drug for breast cancertreatment. However, it tends to accumulate in the heart, thus causing severe cardiacside effects. Nano-formulation of doxorubicin dramatically reduced cardiac sideeffects  while preserving or even enhancing the therapeutic effect of the activedrug . Abraxane, the nanoparticle albumin-bound paclitaxel, is another successstory of nanotechnology in breast cancer therapy. Paclitaxel has been widely used totreat multiple cancer types, including breast cancer. Traditionally, paclitaxel hasbeen formulated in Cremophor® EL since the active drug ishydrophobic. However, this solvent itself can cause severe side effects, such asallergic reactions and neutropenia. Packaging of paclitaxel into the 1303nmalbumin-bound formulation allows for a 50% increase in drug dosage as a result ofdecreased overall toxicity compared to the solvent-based formulation . Multiple technology platforms have been developed to deliver gene silencing agentsfor cancer therapy. The most common approach is to package the double-stranded RNAinto nanoparticles that are less than 2003 nm in diameter. This approach takesadvantage of the enhanced permeability and retention effect of the leaky tumorvasculature . Since the tumor blood vessel endothelium is disorganized with gapsranging from 100 to 5003 nm at the cell juncture , the nanoparticles can easily cross the fenestration to reach tumorinterstitium (Figure 2). Based on the nature of the packagingmaterial, this group of delivery carriers can be divided into lipid-based andnon-lipid-based nanovectors. The lipid-based nanovectors include liposomes , stable nucleic acid lipid particles (SNALPs) , and lipidoid nanoparticles . Non-lipid-based nanovectors contain chitosan , poly(amido amine) dendrimers , polyethylenimines , or other polymeric materials as the building blocks. Conjugates composedof lipid-polymers or polymer-polymers have also been frequently used for siRNAdelivery . Another commonly used siRNA carrier is gold nanoparticles. In addition,nanoparticles free of any added materials except the siRNA building block itself havealso been reported . Dependent on whether there are targeting moieties on the surface of theparticles, these delivery carriers can also be divided into active targeting andpassive targeting vectors (Figure 2). A few products that arecurrently in clinical trial are introduced below. Schematic views of nanoparticle delivery. (A) Nanoparticledelivery by passive targeting. In this mode, nanoparticles pass through theleaky vasculature and enter tumor tissues. (B) Nanoparticle delivery byactive targeting. In this mode, the surface of nanoparticles iscoated/conjugated with an active targeting moiety, such as peptide, antibody,or aptamer. Binding of the targeting moiety with cell surface moleculesfacilities tumor tissue entry of the nanoparticle. siRNA oligos have taken the lead to reach clinical trials for cancer therapy. Mostof the current candidate drugs are formulated into lipid-based nanovectors withoutactive targeting moieties on the surface. Both TKM-PLK-1 from TekmiraPharmaceuticals and ALN-VSP02 from Alnylam Pharmaceuticals use SNALPs as thedelivery vector. The SNALPs consist of the ionizable cationic lipid1,2-dilinoleyloxy-3-dimethylaminopropane (DLinDMA) as the core lipid component.They have a high siRNA encapsulation capacity with a small and uniform size.TKM-PLK-1 consists of a polo-like kinase31 (PLK1)-specific siRNA packaged inSNALPs. PLK1 is involved in cell cycle progression, and targeted delivery of PLK1siRNA suppresses growth and metastasis of Her2+ breast cancer in orthotopicxenograft models . ALN-VSP2 is the first product with dual targeting agents, consistingof siRNA oligos specific to the vascular endothelial growth factor (VEGF) andkinesin spindle protein (KSP) . It is hypothesized that knocking down both genes in the same cancercells might have an additive or even synergistic effect on cell growth andviability. New cationic lipid molecules have recently been identified to preparemore effective SNALP for siRNA delivery . It is anticipated that more gene silencing products based on SNALPwill be developed in the coming years. Since SNALP tends to accumulate in theliver, the main indication of these drugs is to treat liver cancer or livermetastasis of other solid cancers. Atu027 from Silence Therapeutics is composed of a protein kinase N3(PKN3)-specific siRNA in positively charged liposomes prepared with amixture of cationic and fusogenic lipids . PKN3 is a downstream effector of the PI3K pathway, one of the mostimportant pathways in breast cancer biology. Knockdown of PKN3 impairs growth ofprimary breast and prostate tumor, and blocks tumor metastasis . A phase I trial with advanced solid cancer has been completed withthis agent . siRNA-EphA2-DOPC is formulated by mixing the EphA2 siRNA with the neutrallipid 1,2-dioleoyl-sn-glycero-3-phosphocholine in an excessive amount oft-butanol followed by lyophilization . EphA2 encodes the ephrin receptor tyrosine kinase that isoverexpressed in multiple cancer types, including breast cancer. Blocking EphA2activity by antibody-drug conjugates or through knockdown of gene expressioninhibits tumor growth . Additionally, dual targeting of EphA2 and other cancer geneshas shown enhanced tumor growth inhibition . Although most of the initial studies have been focused on ovariancancer, the disease indication for the current clinical trial includes all solidtumors . CALAA-01 from Calando Pharmaceutics is not only the first siRNA therapeutic in ahuman cancer clinical trial but is also formulated with active targeting . The siRNA specific for the M2 subunit of ribonucleotide reductase(RRM2) is encapsulated in a cyclodextrin nanoparticle. An affinity moiety of thehuman transferrin protein targeting ligand is decorated on the surface of thenanoparticle. It has been well documented that the transferring receptor proteinis overexpressed on the surface of cancer cells, and can be used for effectivetumor targeting . The 70nm nanoparticles are small enough to cross the fenestrationfollowing systemic administration. Once inside the tumor tissue, the targetingmoiety would direct the nanoparticle to tumor cells with overexpressedtransferring receptor. The first-in-human cancer trial has demonstratedaccumulation of RRM2. siRNA in tumor tissues and gene-specific knockdown ofexpression . Although the clinical trial was carried out with melanoma patients,there is no reason to believe that CALAA-01 cannot be used to treat other cancertypes such as breast cancer given that RRM2 controls DNA synthesis and damagerepair during the cell cycle. The multistage vector (MSV) delivery system was designed to maximize tumordelivery of therapeutic agents through sequential negotiation with the biologicalbarriers . The system consists of a first stage nanoporous silicon microparticleand a second stage nanoparticle loaded into the nanopores of the first stageparticle. For delivery of gene silencing agents, the double-stranded RNA moleculesare packaged into 30 to 40 nm liposomes that are then loaded into the 60 to 80 nmpores of the porous silicon [38, 39]. Once inside the bloodstream, the first stage particles travel with theblood flow and settle at tumor vasculature, where the liposomal siRNAs arereleased. The pace of siRNA release is determined by the diameter of the nanopore,the size of the liposome, and the rate of silicon degradation. The first stage microparticles are designed based on size, shape, and surfacechemical properties to achieve maximal tumor enrichment. The hemispherical anddiscoidal particles are more effective in adhesion to tumor vasculature thanparticles with other shapes such as spherical and cylindrical . The size of the micro-particle is a major determinant of particleaccumulation. The 1 µm discoidal particles accumulate more than thesub-micrometer or the 3.2 µm particles with the same shape in melanomatissues . Interestingly, the size of the particle also affects the efficiency ofaffinity targeting. Surface conjugation of the RDG targeting moiety significantlyenhances tumor accumulation of the sub-micrometer particles, but has minimumimpact once the size exceeds 1 µm . Surface chemical modification not only affects protein binding butalso determines the loading efficiency of the second stage particles into thenanopores. Since the liposomal siRNA carries a negative Zeta potential, thesurface of the nanopores is modified with polyamine to facilitate loading ofnanoparticles . This system has been successfully applied to deliver siRNA for cancer treatmentwith experimental tumor models [38, 39, 42]. Treatment of tumor mice with one dose of MSV/EphA2 siRNA resulted inknockdown of EphA2 expression for up to 3 weeks due to sustained releaseof liposomal siRNA . It is suspected that the MSV/siRNA in tumor vasculature and otherorgans serves as a depot for constant supply of the gene-silencing agent . In a recent study, Xu and colleagues  treated an orthotopic model of MDA-MB-231 primary tumor with siRNAtargeting the ATM gene delivered in the MSV. Effective knockdown ofATM expression resulted in dramatic inhibition of tumor growth. Sinceefficacy and toxicity constitute the two major aspects of siRNA therapeutics, theyalso carried out studies to systematically evaluate toxicity that might have beencaused by MSV/ATM. After careful evaluation, it was determined that no acuteimmunotoxicity or sub-acute toxicity was associated with MSV/ATM siRNA, paving thepathway for development of MSV/ATM siRNA as a therapeutic agent for breast cancer . One area of siRNA therapeutics that has shown great promise is sensitization tochemotherapy. Overexpression of multidrug-resistant genes has been attributed tochemoresistance. MacDiarmid and colleagues  used a short hairpin RNA to knock down expression of the MDR1 gene in vivo, and subsequently treated murine models of human cancerswith chemotherapy drugs. Navarro and colleagues  synthesized a DOPE-PEI (dioleoylphosphatidylethanolamine-polyethylenimine)conjugate to enhance transfection capacity of the low molecular weight PEI. They usedthe conjugate to deliver MDR1-specific siRNA, and demonstrated sensitizationto doxorubicin treatment of the otherwise resistant MCF-7 cells. We have recentlydemonstrated sensitization of docetaxel treatment by EphA2 siRNA in a murinemodel of human ovarian cancer . Another area that has gained increasing attention in breast cancer therapy is thetarget of cancer stem cells. These cells are resistant to conventional chemotherapy,and are the lethal seeds for tumor recurrence and local and distant metastasis . By comparing differential expression between the bulk of cancer cells andcancer stem cells, we have identified a group of candidate genes that might beessential for growth and survival of cancer stem cells . Our recent experience with MSV delivery of cancer stem cell gene-specificsiRNA oligos has resulted in the development of new breast cancer therapeutics. Theseagents are expected to play a significant role in the fight against breastcancer. Gene silencing agents will continue to contribute significantly to breast oncologytreatment. Recent advances in RNA interference have resulted in the development ofmultiple candidate siRNA therapeutics being evaluated in the clinic. Non-codingmicroRNAs will follow suit to be added to the candidate drug list soon. On the otherhand, development of delivery vectors for most solid tumor types has lagged. There arenot many options available to deliver siRNA/microRNA to primary breast cancer. It isever harder to deliver therapeutics to distant organs of breast cancer metastasis, suchas the brain and bone. More effort should be spent on the design and development oftissue-specific and tumor type-specific delivery systems for siRNAs and microRNAs. stable nucleic acid lipid particle. The authors acknowledge financial support from the following sources: Department ofDefense grants DODW81XWH-09-1-0212 and DODW81XWH-12-1-0414; National Institute ofHealth grants NIH R01CA128797, NIH R01CA138197, NIH U54CA143837, NIH U54CA149196, NIHU54CA151668; Breast Cancer Research Foundation; Cancer Prevention Research Instituteof Texas RP121071; Komen Promise for the Cure KG081694; Golfer's Against Cancer; TeamTiara; Causes for a Cure. Research Corporation, and hereby discloses potential financial interests in thecompanies. The other authors declare that they have no potential conflicts ofinterest.